Q&A With David Bazan: Playing with Band @ The Black Cat on 11/17 & Pilot Light on 11/19! David Bazan, best known as the front man for indie rock band, Pedro the Lion, has become a bit a of a singer-songwriter legend. Since 1996 and the start of PTL, as well as his newest self-titled project, Bazan has been touring and putting out music non-stop. 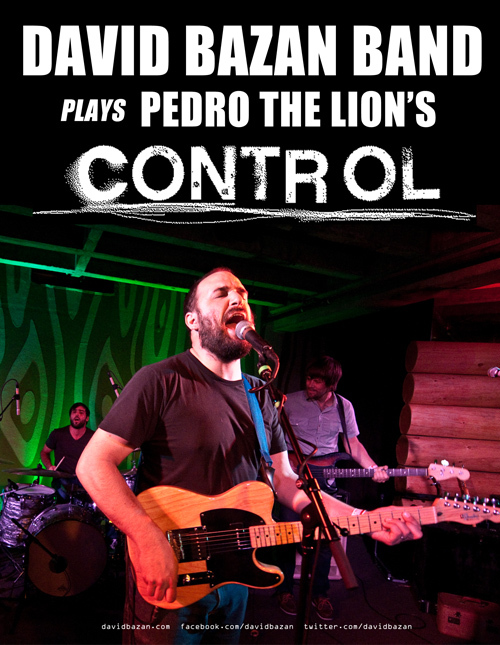 This year marks the 10 year anniversary of Pedro’s probably popular album “Control.” With a fresh stack of reissue vinyl and a full band behind him, Bazan is making his way across the country playing “Control” in it’s entirety as well as other favorites from his discography. I was able to catch up with him and ask him a few questions about the tour and the reissue (forgive me for mostly non-verbatim quoting). TA: How has this tour been going? DB: Amazing. It’s been really, really fun. I’ve done a lot of tours with guys over the years, so it has been going really smoothly. TA: I heard that your van and trailer were damaged due to a drunk driver. I know a lot of fans reached out offering support and kind words. DB: I, my manager, Bob and tour manager, Caleb worked as hard as we could to go everything settled that day in Chicago. Luckily, we had a short a drive to Grand Rapids that day so we were able to fix the van and our equipment, as well as make it there without canceling the show. CG: What made you decide to do the “Control” tour? Was it because of the reissue of the Pedro Discography or just because of the anniversary? DB: Definitely the former. We really wanted to properly promote the vinyl reissue in the best way, and a tour seemed to be the most notable. TA: I heard that not all of “Control” was played live before this tour… Did you choose not to play them for personal reasons or was it because of something else? DB: Some just didn’t work as well live back then. Now that it’s 10 years later, I’m a little better at playing the guitar and we were able to find a better way to work them out. There isn’t really any personal on “Control.” It’s an intensely fictional album and while there are certain themes that really resonated with me, I wasn’t really in those situations. TA: Your latest releases have been solo albums. How is it switching back to a mostly Pedro the Lion focus? DB: It’s really not that bad. Me and the guys I’m with now have been touring a good amount and playing Pedro songs along with my other songs since 2009. Before we even did the decided on playing all of “Control” we already had 7 out of the 10 songs regularly in our set list. Even for this tour, of course we’re playing “Control,” but there are other Pedro the Lion songs in the set list, as well as one Headphones song and some Bazan songs. TA: You’ve basically spent a big chunk of this year on tour. Are you taking a break soon to record and should we expect any 2013 releases? DB: I’ll be on a break from tour for the majority of December and January after this string of shows is over with. I’ll use that time to probably work on recordings and new music. My other band, “Overseas,” with Will Johnson and the Kadane brothers (Bubba and Matt), is going to have an expected release of May or June. I’m aiming for a fall release with a new Bazan record, as well. and Pilot Light in Knoxville on November 19th!